Posted in VInsanto and grappa. “AMPELOGRAFIC” BASE OF THE VINEYARDS: TREBBIANO TOSCANO and MALVASIA DEL CHIANTI. HARVEST: from the mid to late October with initial drying on the plant. DRYING: In castles made of reed mats, in rooms naturally ventilated. PRESSING: End of December or beginning of January, through horizontal presses. REFINING: Glass for 5 years. The results attained by these corporate decisions obtains a great vinsanto done entirely with the old traditional techniques developed by several generations of the Chiostri family that lives in Vegi. A product that speaks, more than others, of the territory and of its history. Golden amber, spices canforate in the nose, soft and sensual touch to the language, the “Luigi Basilio Chiostri 1995” first fills the imagination, then the mouth and finally go to melt into a warm embrace throughout the body. The wooden spiciness, slightly tannic, remind the drinker, the long passing in the kegs and a not less demanding period in the glass has rounded them in velvet soft of light. The almond biscuits are not the only way to enjoy this nectar, which can be meditated alone or even at end meal, in a slow basking in with sweets and dried fruit. 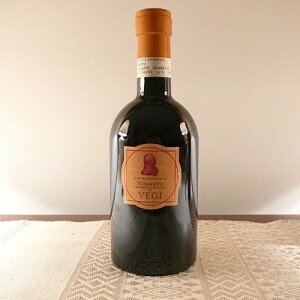 Do not underestimate its combination with Tuscan seasoned pecorino and liver pate. His great balance makes a wine that does not dominate neither the palate neither the table but instead is a perfect and pleasant companion of many dishes, especially red meat, game, cheese and spicy, but not only, with a glass hot and sharp that increases in value.